I have been Dr. Wei's patient for awhile. He performed sinus surgery on me..have noticed a huge difference. Great personality,supportive, and always looking to find a remedy. NEVER long waits for a scheduled appointment. I have been Dr. Wei's patient for awhile. He performed sinus surgery on me..have noticed a huge difference. Great personality, supportive, and always looking to find a remedy. NEVERlong waits for a scheduled appointment. I've seen 3 other ENT specialists regarding my breathing issues and I Have finally found the right person to perform mysurgery, and who I feel actually knew what he was talking about and did a thorough exam in a short amount of time. The facilities are in majorly rough shape but Dr. Wei is great. I've seen 3 other ENT specialists regarding my breathing issues and I Have finally found the right person to perform my surgery, and who I feel actually knew what he wastalking about and did a thorough exam in a short amount of time. The facilities are in majorly rough shape but Dr. Wei is great. Calvin Wei, M.D. is a board-certified and fellowship-trained otolaryngologist with a particular interest in Rhinology and Skull Base Surgery. His clinical focus includes the comprehensive treatment of chronic rhinosinusitis, endoscopic sinus surgery, revision sinus surgery, frontal sinus surgery, cerebrospinal fluid leak and encephalocele repair, pituitary surgery, and minimally invasive, transnasal approaches for sinonasal and skull base tumors. Dr. Wei performed his undergraduate work at Harvard University, where he received his degree in English and American Literature and Language and was inducted into Phi Beta Kappa. He then received his medical degree from Baylor College of Medicine at the Texas Medical Center in Houston where he was a member of the Alpha Omega Alpha Honor Medical Society. He completed his residency in Otolaryngology—Head and Neck Surgery at New York University and fellowship in Rhinology and Skull Base Surgery at the University of Pennsylvania where he trained under the direction of Dr. David Kennedy and Dr. James Palmer, who are internationally known authorities in the field of endoscopic sinus surgery and the endoscopic management of tumors of the sinuses and skull base, and Dr. Bert O’Malley, Jr., who is one of the foremost experts in the fields of head and neck, robotic, and skull base surgery. 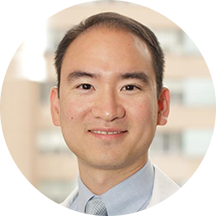 Dr. Wei has given oral presentations at the American Academy of Otolaryngology—Head and Neck Surgery Foundation Annual Meetings and has published multiple articles and book chapters on the subjects of reconstruction of skull base defects, topical irrigations for chronic sinusitis, postoperative management in endoscopic sinus surgery, and the head and neck manifestations of degenerative and autoimmune diseases. Wei CC, Sanfilippo NJ, Myssiorek DJ. Re-irradiation of metastatic disease from xeroderma pigmentosum. Curr Oncol. 2010 Jun; 17(3):83-5. Wei CC, Lalwani AK, Mhatre AN. In vitro expression and characterization of MYH9 mutant alleles linked to hereditary hearing loss. Otolaryngol Head Neck Surg. 2010 May; 142(5): 699-703. Dr. Wei was absolutely wonderful! Extremely kind, deeply empathetic, and very efficient. Highly recommend! I love Dr. Wei, 4 years ago I had sinus surgery no pain at all. My sinus has been perfect ever since. My throat felt like there was a lump inside I thought it was a polyp I had many yearsago. He put a scope through the nose and down the throat. Amazing hands felt nothing and good news no polyps. Instead acid reflux. His memory is impeccable last saw him late 2017 and he remembered why I went to see him and remembered who he referred me to treat my migraines which originally I thought it was my sinus. I was able to secure a last min, day-of appointment with Dr. Wei - he quickly assessed and resolved my problem within minutes. He is really friendly and a pleasure to interact with. Thanks, Dr. Wei! Dr. Wei is a kind, courteous & well knowledgeable professional. He took his time to explain my condition. I highly recommend him. Dr. Wei is a wonderful ENT who pays focused attention on the patient who is with him. He is very respectful and listens closely. I highly recommend Dr. Wei to anyone in need of sinus treatment. Tremendously attentive, got to the root of my problem immediately and began therapy. A pleasure to work with. Dr. Wei is great! Incredibly friendly, warm and made me feel very comfortable. He helped me quickly and effectively and I can't recommend him highly enough. Dr. Wei is amazing! He was very attentive and explained everything perfectly to me on what was happening with my nose and how to take my medication. Dr Wei was great! He is very knowledgeable and explains complicated things in a way that’s easy to understand. Definitely recommend!!!! Dr. Wei is an exceptional doctor. He listened attentively, and he answered your questions. I guessed he treats his patient like family. He examines me very thoroughly and explains my condition to me. He is the best of the best. He has excellent bedside manners. Dr. Wei was amazing and helpful and kind! Dr. Wei provided excellent medical care for an inner ear infection. He has an affable presence and spent time with me discussing my care. It was great! I didn’t have to wait to see him at all. In fact, he was waiting in the room for ME! He explained everything very thoroughly and has a great sense of humor. Glad I chose him as my doctor. Definitely recommend! Dr. Wei is very nice and thorough - however, I was very upset with one aspect of my appointment. I had both an MRI and a CT Scan - I never heard from the office regarding the results, despite leaving aVoicemail inquiring about them. I must say I had a feeling this would be the case when, when he initially sent me for the scans, he said "I'll see you soon to go over the results". I was unable to get an appointment in his office for over 2+ weeks from the scans. When I went in for the "follow up" appointment, it seemed as though Dr. Wei was reading the imaging results for the first time. I personally expect much more - I luckily had been able to log in to NY Radiology and read the reports myself and knew there was nothing "urgent", but I think this is completely unacceptable service. I shouldn't have to book another appointment to hear something that could have easily been communicated over the phone in under 5 minutes. What a waste of medical resources. Dr. Wei is very friendly and very professional. I would recommend him to anyone who needs ENT appointment. HOWEVER, I do NOT appreciate the office, especially his assistant's professionalism. After my appointments, I have been trying to reachout yo get my medical records for insurance purpose. I have left more than five voice mails on different dates, and she never picked up the phone or call back to me. I would never recommend such a place that only wants to charge you money but without adequate after service and professionalism. Great “bedside manner” and very professional. This is my second appointment with Dr. Wei. He has gotten to the root of the issue within minutes of ruling out issues. He doesn't just assume he knows everything which is so refreshing in a Dr. Recommend him highly. Dr. Wei is one of the nicest doctors I’ve ever been to. Very professional and takes time with his patients. Also one of the few times I’ve ever been to a doctor and was seen at my appointment time. As always no wait, profesional and attentive. Highly recommended. Excellent doctor and I have complete confidence in him. He really helps me and explains my treatment. There are not enough words to describe how great I feel after visiting Dr. Wei. He should give lessons to other Doctors on how to treat a patient. He is the absolute best! Dr Wei is a fantastic physician. He tells you what is happening every step of the way. Explains the reasoning behind and results of various test. Details your options and gives great suggestions. First rate doctor. Excellent bedside manner !!! Wonderful doctor. I felt a little rushed. He is the absolute BEST! I feel so comfortable around Dr. Wei. I didn’t have to wait very long after completing my paperwork. It didn’t make it over from ZocDoc but not a big deal. Dr. Wei understood my issue immediately and I’m looking forward to his solution helping me. Professional and friendly, can't ask for better. Very engaging as well as professional. Easily took care of the reason for my visit. Dr. Wei is exceptional! I originally scheduled an appointment with Dr. Wei for my chronic sinus infection and he did a CT scan of my head to see what was going on. After reviewing everything, it was clear I was agreat candidate for a septoplasty and sinus surgery. Dr. Wei is patient, thorough and took the time to show me where my issues were, why I was having chronic problems and what I could expect from surgery. He showed me examples of post-surgery results and explained everything to me in detail. I actually completed the surgery this week and am recovering now. Dr. Wei and the team at Mt. Sinai - St. Luke's were exceptional. I was treated well by all of the staff there, everything was on time, very efficient, and only several days later the straws and packing were removed easily. I can already feel a huge difference even though I know I have a lot more healing to do before the results are optimal. I am someone that appreciates attention to detail and I can tell he did a great job, paying specific attention to what I individually needed done to get the best results. Aside from Dr. Wei's patience and attention to detail, he also has a great sense of humor, is a great communicator and works with the utmost professionalism. If you are looking for an exceptional ENT Doctor, choose Dr. Wei! I’m so grateful to have found Dr. Wei. He was friendly, attentive and very professional. He listened with impeccable focus and he chose a treatment plan I was very comfortable with ; the hallmark signs of an amazing doctor! Thank you, Dr. Wei! Great doc. Super knowledgeable and warm. Took the time to explain everything thoroughly! Dr. Wei was excellent. Office was crowded, but I was seen on time. He listened carefully to my problems, did a few procedures, and explained exactly what was going on for me. A few treatment options were recommended and we decidedon a course of action for the next two weeks. Dr. Wei even helped expedite my departure by sending my prescription to my pharmacy on his tablet while I was waiting on line to setup a follow-up. The office staff was prompt and courteous. Dr. Wei saw me almost immediately, before my scheduled appt. time and was very thorough in his examination and explanation of what he was doing. The audiologist I saw was also very professional and friendly. Checking out was quick and easy. Kind, caring and knowledge. I've been to him three times and was very satisfied every time with his care. I would like to say this was probably one of the best doctor visits I've been to. I got to see the doctor within 10 minutes and not only did Dr. Wei seem extremely knowledgeable but he really took the timeto explain everything to me. He showed me the CT scans and explain the various different options that I have ranging from the recommended approach to the more aggressive methods. I would highly recommend going to him again. Dr. Wei is THE BEST! Always courteous and gets you looked at fast. Dr. Wei spent the time with me to explain clearly my ENT diagnosis also showed me through scope pictures. He also answered all of my other ENT questions and didn't rush me out of the room. Dr. Wei is very thorough, helpful, and personable. A long time patient, never have waited more than 15 minutes for my appt. I have significant sinus issues ...always leave feeling better than when I got there as Dr. Wei always works to find a solution. Dr. Wei has the best bedside manner of any medical professional I've ever seen. It's a pleasure to see him every time. He's also very thorough and knowledgeable.